This section describes the transport layer security options for LDAP, and especially how to enable LDAPS on ApacheDS. Several requirements related to security can be easily accomplished with the help of SSL technology (Secure Socket Layer) or its standardized successor TLS (Transport Layer Security, RFC 2246). Among these are the protection of data against eavesdropping and modification, when on transit between client and server (data integrity), and the authentication of a server toward a client with the help of a certificate. There are two approaches to utilize these technologies in the LDAP world. The first option is comparable to HTTPS and inserts an SSL/TLS layer between the TCP/IP protocol and LDAP. Establishing a connection like this is normally provided via a different server port (port 636 is common, it is a well-known port, like port 389 is for LDAP). 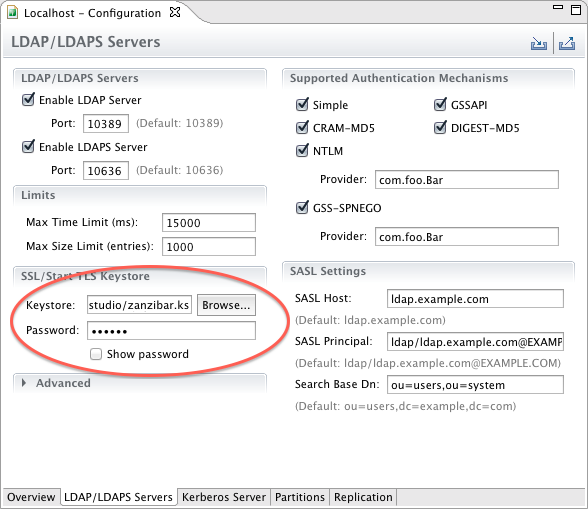 In URIs the schema "ldaps" is specified (for instance ldaps://zanzibar:636/) instead of "ldap". It is possible to write programs which switch between ldap and ldaps without changes in the source, if the connection data is configured external. 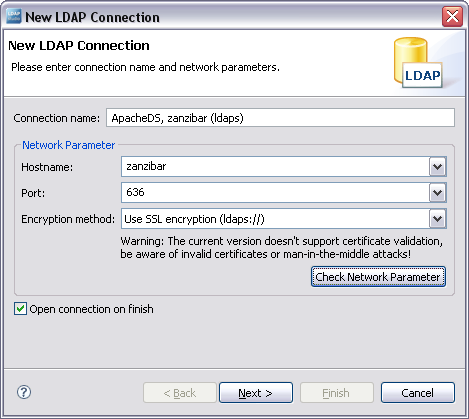 In the second option a client establishes at first a "normal" LDAP connection. With a special request (extended operation StartTLS) it tries to switch to secure communication afterwards. It is not necessary to change the port for this, the communication continues on the established connection. The client may go back to the original connection state ("TLS Closure Alert"), in doing so protecting only selected parts of the communication. Both ways to utilize SSL/TLS within LDAP require the configuration of the server with an appropriate certificate. **LDAPS** is considered as deprecated. You should always favor startTLS instead. ApacheDS 2.0 supports both options and requires a JDK 1.5 or above. The feature is enabled by default, but you may need to configure it. There are some steps to follow in order to obtain a SSL enabled server. In order to keep it simple for beginners, you don't need any certificate to get LDAPS working. The latest version generates its own self signed certificate. From the user point of view, it's just a matter of enabling the ldaps service to get it working. However, if one wants to use a signed certificate, another configuration is needed, where you tell the server about the keystore to use, and the certificate password to use. 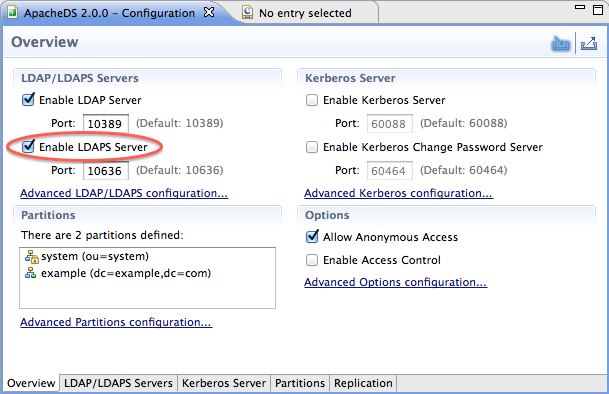 As soon as the "Enable LDAPS server" checkbox is checked, your server is LDAPS capable ! A certificate is a signed public key (signed normally by a third party, a certificate authority, CA). There are different options - either you buy a certificate from a Certificate Authority (like Verisign, etc. ), or you obtain one from your enterprise CA, if available - or you ask for a free certificate from CACERT organisation - or you create your own certificate, self-signed or signed by your private CA, which will not be trusted. -keyalg "RSA" Algorithm to be used to generate the key pair, in our case, default is "DSA"
Learn more about keytool at the manpage. Another option is to use graphical tools for key creation like Portecle, which is basically a user-friendly front-end for keytool with comparable functionality. For a first impression see a screen shot below. After modification of the configuration, the server has to be restarted in order to take effect. After restarting the server, you should have a server offering both ldap and ldaps. How to verify whether it works? Afterwards the connection behaves like LDAP does. No difference in functionality, but the transmission is secured by SSL. Because our self-signed certificate is not trustworthy, many tools will present a warning (as Studio). You will likely be able to view the certificate, and decide to continue (accepting the certificate always or this session only), like with web browsers. If you use other graphical clients, the behavior will be comparable. Sometimes clients don't allow to connect to a server, if the certificate is not trustworthy. This is for instance the case for Java clients using JNDI. 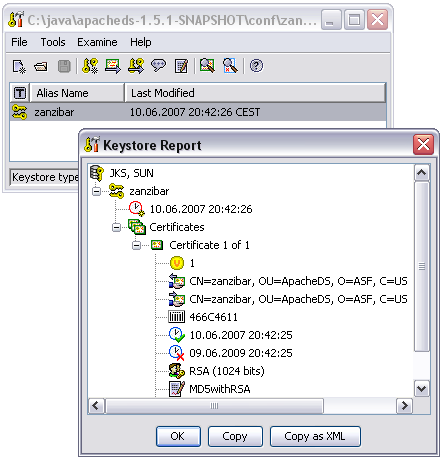 Instead of using the command line version of keytool, it is also possible to perform the certificate export and import operations with Portecle or any other graphical frontend. This is for instance how the trusted.ks files with the imported certificate looks like in Portecle. Another option would be to import the certificate in the default keystore of the JRE installation (within $JAVA_HOME/jre/lib/security). For a test certificate this proceeding is not appropriate. You should be able to determine any SSL-related configuration problem with the help of this log.